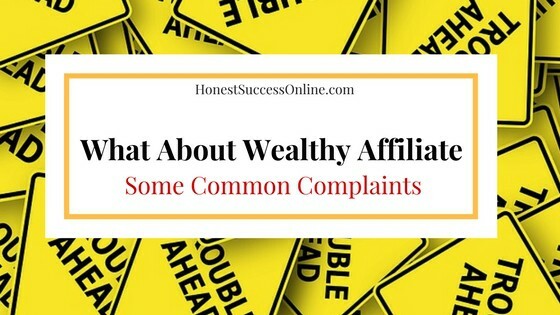 I think it is time to have a closer look at some common complaints people have about Wealthy Affiliate. All these raving reviews about WA (including my one). There must be a few flaws in the system, surely. Well, it is time to find out, and of course, to every complaint, there are two sides of the coin. So I will explain my point of view as well. I have tried to collect as many complaints as possible. If you would like to add any, please do so in the comments below, and I will answer your concerns to my best ability. There are few people who sign up with Wealthy Affiliate and think that they will automatically make sales. Or, they set up a website, add some posts, and affiliate links and they are all ready to go. But where is the money? Let’s get things straight. Wealthy Affiliate is a learning and hosting platform that provides step-by-step certification courses; video live classes and classrooms to teach you the basics and beyond on how one can succeed with their online business. WA is a tool. It doesn’t do the work for you. YOU HAVE TO DO THE WORK! My advice is to follow the training one lesson at a time. Don’t skip any lessons and if you have any questions, always ask! When you make your first sale depends on many factors: How often do you post? Is it quality content? Do you provide value to your readers? What niche are you in? – just to name a few. Wealthy Affiliate doesn’t promote a get quick rich scheme. With a huge twelve plus years of experience in internet marketing from the owners Kyle and Carson, they certainly know what they are talking about. I am the best example. I started as a complete newbie with no prior knowledge whatsoever, but here I am with three websites and some money coming in. Now and again I hear some folks complain about the membership fee or they can’t afford to pay the fee anymore. 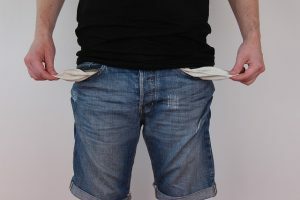 Some say, they can’t justify spending the money because their website isn’t earning anything yet. My answer to this is: the features that are included in the WA premium membership are extensive. I discussed them in detail in my WA review. Just as an example, the hosting for up to 25 domain websites and 25 siterubix -sites are included in the membership. That also includes a free SSL certificate for each of the 25 domain sites!!! Secondly: How much do you pay for college, university or to learn a trade? 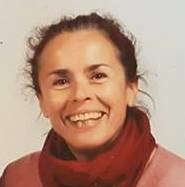 I studied social work for three years in Germany and had to pay off a student loan of around $15 000. By the way, that is actually not much compare to other studies. I also pay for my three kid’s a school fee because they are attending a Catholic school. We are not rich, but I know they get the best education at this school. So we pay NZ$ 1400/year. Why? Because it is worth it. If I pay the WA annual membership of $359/year; in three years time it will add up to $1077. That is an affordable education. After three years with WA, I will be a pro at internet marketing, and I certainly will have a full-time income from my sites. I understand that it can be a struggle to pay the monthly fee, especially when you have a family and bills are piling up. It was not always easy for me to pay the monthly membership (in NZ$ 67). BUT, I always put the money aside to further my learning. It is my online business, and I treat it as a business. After you cancel your membership, you have 30 days to transfer your websites to another hosting platform. The good news is that you can always resubscribe to WA. Your account will be just put on hold. I think that is pretty cool since you can get back into it straight away. I remember when I opened my free account with Wealthy Affiliate that quite often I got a reminder to become a premium member. If you do so in the first seven days you only pay $19 for the first month. I took the offer because I knew it was the right step for me. Keep in mind, once you are a premium member you can’t go back to the free membership! My advice: check out WA for free as long as you want and make up your mind in your own time. When you are new to WA, it can be overwhelming. There are the training lessons and video classes on the one hand and the community area on the other. The scenario looks like that: Strangers are welcoming you to the community and start following you. Then you are supposed to start the training, find a niche and build a website. 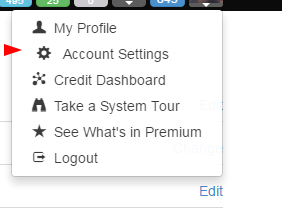 You need to set up your account, upload a photo and write a blurb about yourself. My advice: Take it easy. Do one thing at the time. Have a good look around but also take a deep breath. You will get used to it. The main thing is to get started. Little baby steps are enough. Write a little bit about yourself. One of the strengths of WA is the community. It is easier to communicate with someone when you know his/her background, what their motivation is and why they have joined WA University. The WA community is one of the key factors for your success. Why? You can read more about it here. I found this complaint on the website of bbb.org. BBB stands for Better Business Bureau. Even though WA is not an accredited business with BBB, it has an overall rating of A-. I think that is pretty good. But back to the complaint. Every premium member can write one blog post per day but has to stick to certain rules. Wealthy Affiliates doesn’t allow Spam. In fact, there are 21 rules about what not to post including no self-promoting, no posting links to your website, no affiliate links, no asking for money, no posting political or religious content. 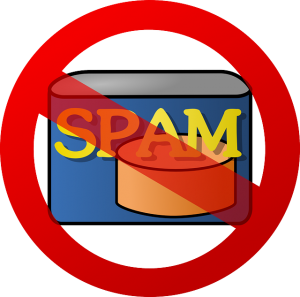 At the beginning of each blog, there is the option to report an individual post as spam. I admit I used it a couple of times. I guess, it is always a very personal decision. Another way of dealing with it is to write them a personal message with a reminder of the writing, no spam rules. If quite a few members report the post as spam, then action will be taken, and the particular member is not allowed to post for a while. Here is another complaint I read on BBB.org. This claim is pretty clear. The member wasn’t aware of the fact that the premium membership is recurring. That is standard practice with memberships. With any magazine subscription, insurances, email providers, etc. most payments are recurring. I have tried to make this list as comprehensive as possible. If you have any concerns or know of complaints, please leave them in the comment section. 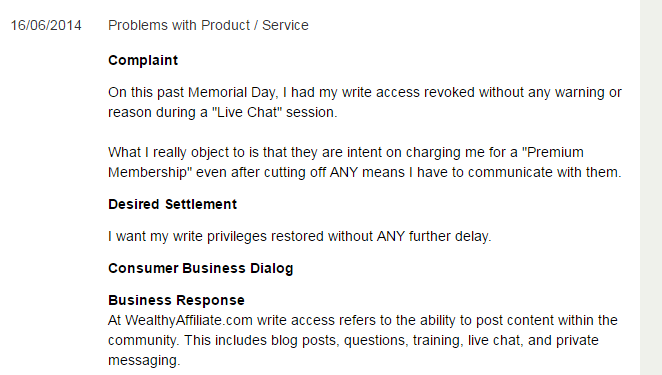 Considering that Wealthy Affiliate has more than 200 00 members the number of complaints are remarkably small. It speaks volume for the overall quality of this awesome online training platform and community of like-minded entrepreneurs. So put your credit card away and check out WA for yourself. By the way, many people have the perception that WA is only for newbies. Here are some examples of members who are already successful and share their knowledge with their fellow peeps. 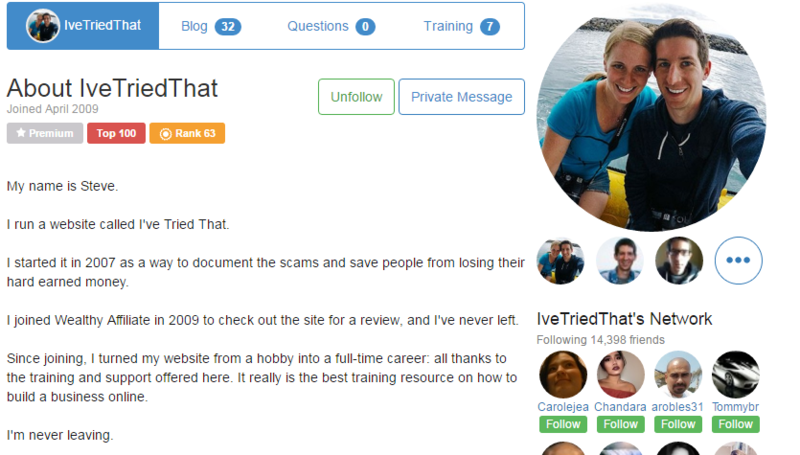 You might know Steve, the owner of the website ivetriedthat.com. 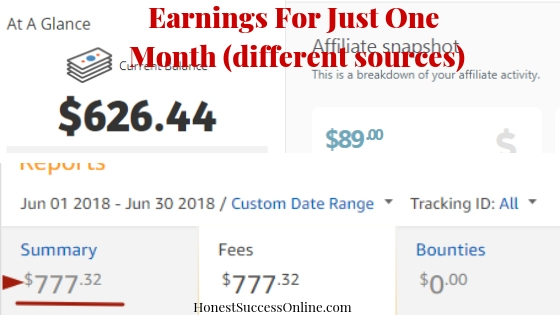 He is a hugely successful internet marketer, and as you can see on the screenshot, he has written 32 blogs and created seven training to share his wealth of knowledge with us. 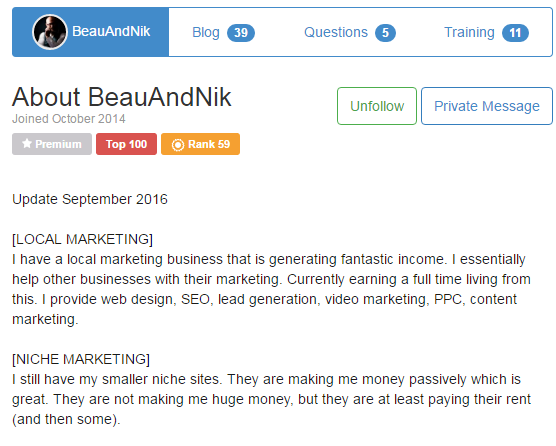 Another example is Beauandnik who is very successful in local marketing but also makes money with affiliate sites. He has created 11 pieces of training and wrote 39 blogs. That is the power of the WA community. Sharing knowledge so other members can learn from it. I would love to hear your thoughts. Please share in the comments below.